This white finish outdoor wall twin LED spot light with PIR sensor and manual override facility is rated IP65, practical and stylish. 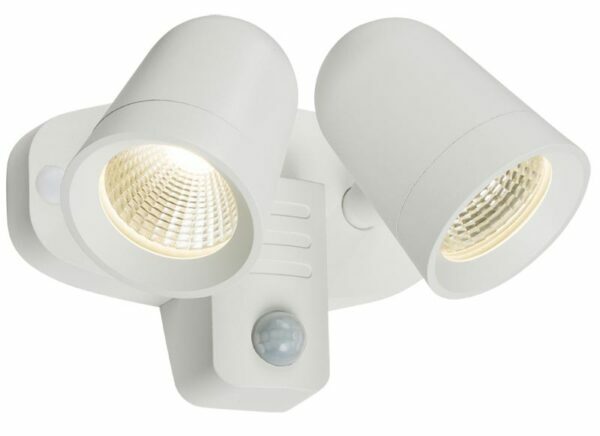 Constructed from cast aluminium, with integral motion sensor and two 9w LED spot light heads that swivel and tilt, so you can direct the light where its needed. Switch the power on and off twice within a 3 second period to enable the manual override facility. The integral PIR motion sensor has a maximum detection range of 8m when mounted at the recommended 2.4m height. The light activates for a fixed time of 90 seconds when activated. The built in lux sensor ensures that it only operates during the hours of darkness. Does this fitting require a normal 240v supply? Yes, this security light requires a 230v supply to it.